In the early 1980s, there was a palpable concern among staffers at the American Israel Public Affairs Committee (AIPAC) of the looming rise of an Arab-American lobby aimed at challenging the pro-Israel community. The National Association of Arab-Americans (NAAA), founded in 1972, was at a high point, and in 1980, former U.S. senator James Abourezk established the American-Arab Anti-Discrimination Committee (ADC). In 1985, James Zogby added the Arab American Institute. Some pundits predicted that AIPAC had finally met its match, and a few of AIPAC's own top supporters were alarmed. The Arab-American lobby looked as if it was on an upward trajectory. Hezbollah's secretary general Hassan Nasrallah publicly admitted that without European Union aid and backing, "our funding [and] moral, political, and material support will ... dry up." However, attempts to mobilize Americans of Arab origin in a crusade against Israel have been limited by the fact that this agenda is not a critical interest for the majority. About two thirds of Arab Americans (63 percent) derive from Christian minorities in the Middle East, who have suffered at the hands of extremist Arab-nationalist and Muslim groups in their home countries. More than half of all Arab Americans are Lebanese and Syrian Christians, who know the damage done to Lebanon by Syrian Baathists, Palestinian terrorists, and the Shiite Hezbollah. A third of all Arab Americans are Maronite Christians and are more faithfully represented by organizations such as the American Lebanese League, devoted to saving Lebanon from Arab extremists, rather than organizations crusading against Israel or supporting the Palestine Liberation Organization (PLO). Only a minority of Arab Americans, then and now, seeks to support organizations whose sole or main purpose is conducting political action against Israel; and some of those who are attracted to the anti-Israel agenda are so radical that such organizations do not want them. The largest Arab-American group, the American-Arab Anti-Discrimination Committee (ADC), attracts recruits by combating anti-Arab bias and stereotyping inside the United States, a cause understandably closer to the hearts of many mainstream Arab-American families than importing into the United States the struggle against Israel that brought so much misery in their countries of origin. The National Association of Arab-Americans, which focused on the Israel agenda, has ceased to exist altogether since it merged into ADC in 2001. Today, Arab-American organizations are a factor in the Middle East debate but certainly have not risen to a level that can challenge the influence of the American friends of Israel. Another issue that raised concern in the pro-Israel community in the 1980s was the growth of a "petrodollar lobby" in the United States, fueled by the giant oil companies and embassies of Middle East countries such as Saudi Arabia, awash in a flood of money since the Organization of Petroleum Exporting Countries (OPEC) quadrupled oil prices in the 1970s. AIPAC founder Isaiah Kenen had described the Arab lobby as a "petro diplomatic complex." Steven Emerson wrote about the petrodollar lobby in his 1985 best-seller, The American House of Saud, revealing how Arab embassies and firms that seek Arab contracts employ prominent U.S. figures such as former Senate Foreign Relations Committee chairman William Fulbright, former White House aide Frederick G. Dutton, former secretary of the treasury William Simon, former Texas governor John Connally, former budget director Bert Lance, and former vice president Spiro Agnew. Yet it is difficult to see significant evidence of the impact of the petrodollar lobby in the Arab-Israeli sphere or any major effort on their part to interfere in the bilateral relationship between the United States and Israel. Oil firms, Arab embassies, and their lobbyists do have considerable influence in the sphere of energy policy, and on some Persian Gulf issues, including arms sales to Arab gulf states. But their main focus is on the rich and comparatively moderate Arab countries, not Israel's less prosperous neighbors such as Egypt, Jordan, Syria, Lebanon, and the Palestinians. And they have shown no signs of seeking to do battle against AIPAC and the friends of Israel. In fact, on a few select projects (notably Turkey policy and the Baku-Ceyhan Caspian pipeline), AIPAC and their interests have aligned and the two lobbies have in fact cooperated with each other. Even when they differed, as on Iran, it was a clash of interests about economic sanctions rather than an ideological dispute about Iran itself. Long experience in Washington leads to a different and somewhat surprising conclusion. The strongest external force pressuring the U.S. government to distance itself from Israel is not the Arab-American organizations, the Arab embassies, the oil companies, or the petrodollar lobby. Rather, it is the Europeans, especially the British, French, and Germans, that are the most influential Arab lobby to the U.S. government. The Arabs know this, so their preferred road to Washington often runs through Brussels or London or Paris. Nabil Shaath, then Palestinian Authority "foreign minister," said in 2004 that the European Union is "the ally of our choice." The Arabs consider Europe to be the soft underbelly of the U.S. alliance with Israel and the best way to drive a wedge between the two historic allies. The Europeans are particularly formidable in their influence over U.S. Middle East policy because of four advantages. First, although there exist subtle differences, many European leaders share a broad set of common beliefs about Israel, the Palestinians, the Arab world, and the Middle East conflict that are considerably closer to the Arab perspective than to Jerusalem's point of view, and closer to the Arab end of the spectrum than the prevailing views of U.S. policymakers. Second, they—especially representatives of Britain, Germany, and France—have easier and closer access to U.S. officials up to and including the president than do either the Arabs or the Israelis. Third, the Europeans couch their presentations within a wider framework of shared values and interests and mutual trust with the United States, so the message is taken more seriously than if it came from an unelected leader of an Arab society vastly different from the United States. The direct access to the president that is available to the prime minister of the U.K., the president of France, and the chancellor of Germany has less to do with the personal chemistry that may exist between them and any given U.S. president than with the objective importance of their countries to the United States. Britain, France, and Germany are three of the top six economies in the world and three of the top six military powers, as ranked by defense expenditures. Two of them—France and Britain—are among the five permanent members of the U.N. Security Council who hold the power to veto. The same two are among the world's leading nuclear powers. Four European countries—France, Germany, Britain, and Italy—sit among the Group of Eight (G8), a forum also including the United States, Canada, Russia, and Japan. The British, French, and German governments have the greatest influence over the foreign policy of the European Union and the greatest influence over Europe's voice in the Middle East Quartet (which consists of the United States, the EU, Russia, and the U.N.). The United States also has a longer and deeper history of shared values and common interests with the major European countries, and fewer conflicting interests, than with Russia, China, or any Arab nation. For sixty-five years, Britain, France, and Germany have been our key allies in the United States' principal military and political alliance, the North Atlantic Treaty Organization (NATO). Their opinions are stated in a moderate tone and are deemed to be more reasonable than the majority of Arab countries. There is a presumption on both sides that they are America's principal partners, the ones whose interests Washington must always take into account, and who can be expected to give greater deference to America's own needs. at the National Security Council, the Department of State, the Pentagon, and within the intelligence community and other agencies. Assistant secretaries, office directors, and senior advisers give special weight to the opinions of their French, German, and British counterparts and spend more time with them than they do with the Arabs. These Europeans also have easy access to members of Congress and their senior staffs. A dramatic example of how European intervention can drive a wedge between the United States and Israel occurred nearly twenty years ago in the sharp confrontation between President George H.W. Bush and Jerusalem. The untold story about this was the role of a European leader, British prime minister John Major, in provoking what may have been the worst episode ever to occur between a U.S. president and the government of Israel. It was a famous clash but one that might well not have occurred but for the European leader's intervention. The Kuwait war had just ended in 1991, and President Bush announced on March 6 his intention to convene an international conference on peace in the Middle East. At the same time, the Soviet Union was in its final stages of collapse, and Soviet Jews who had been prevented from emigrating were flooding out. More than 200,000 had already arrived in Israel, and a tidal wave of more than one million was expected to follow imminently. Israel faced grave challenges to absorb such an enormous influx, equal to 20 percent of its existing population. On May 5, 1991, the Israeli ambassador to the United States, Zalman Shoval, announced that Israel would soon ask Washington for $10 billion in loan guarantees to help provide housing for one million Soviet immigrants expected to arrive during the next five years. The Palestinians feared that the new immigrants would settle in the disputed territories. President Bush and his secretary of state, James A. Baker, declared that if any new loan guarantees were to be granted they would have to be linked to a commitment by Israel not to use the money in the territories. A mechanism would have to be found to ensure that the loan guarantees would not be used to support settlement activity, lest the international conference announced by the president be undermined. To permit time to find a formula, Prime Minister Yitzhak Shamir agreed to delay Israel's official request for the loan guarantees for three months until September 6. During the summer of 1991, Secretary Baker made numerous trips to the region, looking for a way to avoid a collision between the loan guarantees and the peace process. A few AIPAC colleagues and I were involved in some of the behind-the-scenes negotiations, conducted primarily by Elyakim Rubinstein, the Israeli government secretary, Secretary Baker and his staff, and Senator Robert Kasten, Jr. (Republican of Wisconsin) on behalf of pro-Israel members of Congress, and Ambassador Shoval. By mid-August, we were relieved to learn, via communication with Baker and his staff, that a solution acceptable to Washington had been devised. The president had not yet approved it, but Baker was confident that he had a formula that would be acceptable to all sides. For AIPAC, this was a matter of paramount importance because it affected the fate of a million imperiled Jews, a historic effort to initiate a peace process, and the bilateral relationship between Israel and its most important ally. George H. W. Bush was vacationing at his family's summer home in Kennebunkport, Maine, in late August 1991 when British prime minister John Major and his wife Norma visited. It was the kind of informal quality time directly with the president, unmediated by aides and advisers, that makes European leaders so influential on issues like the Middle East. Major had just told the Egyptian press that Israeli settlements, including those in East Jerusalem, were "illegal" and "damaging" to the peace process, and he wanted Bush to stand up to Israel. Baker was pressing the president to compromise, but the British leader urged him to take an absolute stand. Bush returned from Kennebunkport with his mind changed according to subsequent reports from U.S. officials. To Baker's surprise, the president rejected the package of assurances the secretary had carefully assembled and decided to throw down the gauntlet to Israel and its supporters. On September 6, 1991, he asked Congress for a 120-day delay on the loan guarantees "to give peace a chance." We're up against very strong and effective … groups that go up to the Hill … There were something like a thousand lobbyists on the Hill working the other side of the question. We've got one little guy down here doing it. … The Constitution charges the president with the conduct of the nation's foreign policy … There is an attempt by some in Congress to prevent the president from taking steps central to the nation's security. But too much is at stake for domestic politics to take precedence over peace. Asked what was the lowest point in the history of U.S.-Israel relations, many experts would pick this clash over the loan guarantees. It was, at the very least, one of the most serious setbacks in the relationship. But the role of a British prime minister in undoing months of effort by the mediators and instigating the clash has never been exposed until now. It is an example of the way a key European can interact with the highest decision-maker in the United States and move him toward the Arab point of view and away from Israel. This kind of European influence is difficult to track because it occurs behind-the-scenes, invisible to the public. It covers a wide range of Middle East issues: pushing Washington to pressure the Israelis to make concessions to the Palestinians; urging engagement with terrorist organizations such as Hamas on the theory that it will moderate them; getting Washington to restrain Israeli security measures such as the "fence," targeted killings, the blockade of Gaza, and allegedly excessive use of force; and provoking intensified opposition to Israeli settlement activity, especially in Jerusalem. There are many suppositions why Europeans tilt against Israel and toward the Arabs. For one thing, the Middle East is a place where Europeans can flaunt their foreign policy independence from the United States without responsibility for causing catastrophic results because they assume that the United States will protect Israel from any dire consequences such may produce. For another, Europe depends more heavily on trade with the Arab world and on Arab oil exports than does the United States. For example, the Arab gulf states are a $300 billion import market for world products, compared to Israel's $50 billion imports. Europe may also have a desire to appease the "strong horse" in the region (e.g., Israel has but one vote in the U.N.; the Arabs have twenty-five votes, the Muslim nations, fifty votes). Then there is the guilt among many Europeans over their discredited imperial past, leading them to falsely view Israelis as oppressing Third World peoples. Then, again, it may be the growing influence of Europe's own Muslim populations (e.g., Arabs in France, Turks in Germany, South Asians in Britain) and their need to keep such segments of their domestic populations as quiescent as possible. Some analysts suggest that there may also be an element of satisfaction at being free to censure Jews in Israel, relieving European guilt over responsibility for the Holocaust. Finally, it may be that the Europeans simply do not understand that Israel is a democracy at war, living in a mortally dangerous neighborhood, which must act in self-defense in ways that may seem excessive to onlookers in a benign environment such as twenty-first-century western Europe (even though the Western democracies and the United States have used harsher means than Israel in wars far removed from their own territory). One of the things the Europeans want from Washington is intensified pressure on Jerusalem to make concessions in peace negotiations, in order to get an agreement with the Palestinians. Europeans like the idea of deadlines, international conferences, verbal and economic pressure on Israel, and other devices, to dislodge the Israeli government from what they tend to see as its "intransigence." For example, in 2002, the Europeans hatched the idea of a "road map" with deadlines for the creation of a Palestinian state to force Israeli-Palestinian negotiations to a conclusion. On September 17, 2002, European officials presented a plan to Washington that they had drafted with Palestinian participation and endorsement. Jerusalem strenuously objected to deadlines that ignored Palestinian noncompliance with past signed obligations, and U.S. officials expressed reservations about the European approach because the blueprint was too detailed at too early a stage. But Secretary of State Colin Powell, nonetheless, joined the EU, the secretary general of the United Nations, and Russian foreign minister Igor Ivanov in signing the Quartet statement announcing "a concrete, three-phase implementation road map that could achieve a final settlement within three years." German foreign ministry spokesman Andreas Michaelis said that the content of the Quartet pact was "nearly identical" to proposals put forward by EU foreign ministers. EU Middle East envoy Miguel Angel Moratinos said it was "a European idea and not an American idea." It was a vehicle for European and U.S. pressure on Israel. progress between the three phases would be strictly based on the parties' compliance with specific performance benchmarks to be monitored and assessed by the Quartet … Progress … will be based upon the consensus judgment of the Quartet of whether conditions are appropriate to proceed, taking into account performance of both parties. Solana's plan is a classic example of the pressure paradigm: Frustrated by the slow pace of direct negotiations between the parties, the world powers seek to dictate a final status outcome, especially to Israel. French foreign minister Bernard Kouchner moved in the same direction in February 2010: "One can imagine a Palestinian state being ... recognized by the international community, even before negotiating its borders. I would be tempted by that." Kouchner and his Spanish counterpart Moratinos wrote that the European Union "must not confine itself to the … outlines of the final settlement;" it "should collectively recognize the Palestinian State ... There is no more time to lose. Europe must pave the way." The EU as a whole has not gone this far yet. In November 2009, the Palestinians formally asked the EU to urge the U.N. Security Council to recognize a unilaterally declared state, only to be told that conditions were not yet ripe for such a move. But in March 2010, under EU pressure, the Quartet set a 24-month deadline for final settlement of the conflict and the creation of an independent Palestinian state. Kouchner said: "France supports the creation of a viable, independent, democratic Palestinian state ... by the first quarter of 2012." Another persistent theme of European policy is pressure on U.S. administrations to engage with terrorist organizations on the theory that such engagement will moderate their behavior. The PLO: For years, the U.S. government had a strict policy of not negotiating with the PLO until it renounced terror. The Ford administration affirmed it in writing in 1975: The United States "will not recognize or negotiate with the PLO so long as the PLO does not recognize Israel's right to exist and does not accept U.N. Security Council Resolutions 242 and 338." In 1985, President Reagan signed it into law. In November 1988, Yasser Arafat finally bowed to the U.S. conditions and renounced armed struggle, and Reagan authorized the first contacts between U.S. officials and the PLO. The Europeans never accepted the idea that recognition of the PLO should be conditioned on it renouncing terror and accepting Israel's right to exist. Fully eight years before Arafat seemingly renounced terror and recognized Israel, the European Economic Community, including the governments of Britain, France, and Germany, warned Washington in the 1980 Venice declaration, that the PLO had to "be associated with [peace] negotiations ... to exercise fully [the Palestinian] right to self-determination." Throughout the period that U.S. administrations shunned the PLO as a form of pressure to induce it to renounce terror, European leaders condoned contact with the organization and various forms of recognition and tried to move the U.S. policy. 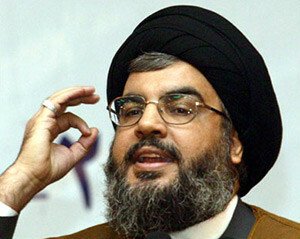 Hezbollah: A similar tension exists today between European and U.S. policies toward Hezbollah. The U.S. State Department designated Hezbollah as a foreign terrorist organization in 1997, and U.S. officials have repeatedly called on EU governments to implement a similar ban to allow their own law enforcement and intelligence agencies to curb Hezbollah operations. Hezbollah's secretary general Hassan Nasrallah publicly admitted that if the EU did this, "our funding [and] moral, political, and material support will ... dry up." But EU foreign policy chief Solana claimed in July 2006 that the EU did not have enough evidence to determine whether Hezbollah should be listed as a terror organization. Two-hundred and thirteen members of Congress wrote to Solana in protest. In June 2009, Solana went even further and met with a Hezbollah official who had been elected to the Lebanese parliament, saying that "Hezbollah is a member of the Lebanese society." Likewise, several European countries, led by France, have told Washington that Hezbollah is a legitimate Lebanese political party with a military wing, not primarily a terrorist organization, as if the idea of an armed political party is not a contradiction in terms. In 2005, French president Jacques Chirac rebuffed a U.S. request to add Hezbollah to the EU terrorist blacklist, arguing that it is an important part of Lebanese society. In 2006, Italian foreign minister Massimo D'Alema said that "apart from their well-known terrorist activities, they also have political standing and are socially engaged." In July 2007, French foreign minister Kouchner hosted a meeting that included Hezbollah in an effort to broker a Lebanese political compromise, in spite of objections expressed by ninety-one U.S. congressmen. A Ministry of Foreign Affairs spokesperson declared, "Hezbollah is an important political group [that should be] fully integrated into the political scene." The spokesperson was prompted to make this statement only two years after the assassination of former Lebanese prime minister Rafik al-Hariri, for which Hezbollah leader Nasrallah has stated that he expects a U.N. tribunal to indict members of his group, and twenty-two years after the October 1983 attack on the Beirut barracks where fifty-eight French paratroopers were killed, an act for which Hezbollah leader Imad Mughniyah was indicted by a U.S. grand jury in 1985 and for which a U.S. federal judge found Hezbollah to be guilty in 2003. Although the Europeans may not yet have succeeded in getting Washington to accept Hezbollah as a legitimate political party, they have contributed to an environment in which such a shift will be a growing temptation for U.S. leaders as Hezbollah tightens its noose around Lebanon. Hamas: European policy toward Hamas is somewhat different than its stance toward Hezbollah. Under U.S. pressure, the military wing of Hamas was put on the EU terror list in December 2001, and its "political" wing was added to the list in September 2003. Hamas's violent takeover of Gaza in June 2007 placed conflicting pressures on the Europeans. The violence of the Hamas putsch, the organization's fierce ideological doctrine, and the firing of thousands of Qassam rockets into Israel since the Gaza takeover, cast doubts even among the most gullible Europeans that the organization was in fact evolving in a moderate direction. But the reality that Hamas has control over the people of Gaza, a population for whom many Europeans feel a special responsibility, reinforces the belief that it must be deemed a partner, both for the delivery of humanitarian aid (even if a terrorist organization might siphon off funds) and for political negotiations over the future of Gaza. Hamas exists. We should not ignore this fact. It's a complex structure that we should help to evolve toward pro-peace positions ... One must push for dialogue so that it happens ... There will be no peace in the Middle East as long as the Palestinians are split in two. Javier Solana, then the European Union's foreign policy chief, said in 2006 that it was "not impossible" for Hamas to change. "I don't think the essence of Hamas is the destruction of Israel. The essence of Hamas is the liberation of the Palestinians." This idea is disputed by statements by Hamas itself, reiterating its longstanding commitment to Israel's destruction as a prerequisite to the establishment of an Islamic state in the whole of Palestine. French foreign minister Kouchner thinks there will not be an Israeli-Palestinian peace agreement without Hamas at the table. He said in January 2009 that "we realized this long ago— that Hamas was one of the interlocutors" in the Middle East peace process and that "we believe we will have to talk to them when they ... agree to start negotiations." A ministry spokesman said that Paris would be ready to talk to a Palestinian unity government that included Hamas as long as it "respects the principle of the peace process." Lord Patten, EU commissioner for external relations, 2000-04, says the sole condition for talks with Hamas should be an agreement to a ceasefire even if Hamas refuses to accept past signed agreements. Massimo D'Alema, Italy's foreign minister, 2006-08, believes that Hamas is more like the Irish Republican Army (IRA) than akin to al-Qaeda. Sweden granted a visa to a Hamas minister in 2007, and the former Finnish foreign minister, Erkki Tuomioja, claimed that Hamas "is not the same party it was" before it won the 2006 elections. Benita Ferrero-Waldner, the EU's external relations commissioner, 2004-09, announced that she would review the EU ban on direct aid to the Hamas-led Palestinian government though she backed away from this position after Hamas seized control of Gaza and arrested Fatah officials in June of 2007. These European voices advocating political negotiations with Hamas have not yet convinced either EU officials or Washington. The main obstacle is not Jerusalem's objections but reluctance to undermine the Palestinian Authority headed by Mahmoud Abbas and Salam Fayyad. But if the "moderates" led by these two slip, resistance to pressure from supporters of negotiations with Hamas may begin to erode. Many Europeans may simply not have the fortitude for a long struggle with implacable foes and may be easily lulled into wishful thinking that the West can moderate Islamic extremists simply by talking to them. Israel's Security Fence Is "Illegal"
A third continuing theme of the Europeans is that many of the measures that Israel employs to assure its security are excessive and disproportionate if not actual violations of international law. This is how Europe sees Israel's security barrier, its targeted killings of known terrorists, its blockade of Gaza, its campaign against Hezbollah in Lebanon, and its settlements in the West Bank. Europeans are constantly urging Washington to restrain Israel. Israel's security fence against terrorist infiltration, under construction since 2003, has strong support among the Israeli public because the barrier has been effective in preventing suicide attacks. A recent public opinion poll finds that "it is hard to find any issue in Israel about which there is so wide a consensus." When there was no fence, during the first three years after the launch of Arafat's al-Aqsa intifada in September 2000, Israel suffered ninety-three suicide attacks that left 447 Israelis dead and 4,343 Israeli civilians wounded. In the most recent four years, since most of the fence has been completed, the number of attacks has declined to fewer than five a year, and the number of Israelis killed by terrorists has averaged fewer than ten per year. The barrier being erected by Israel as a part of its security effort must be a security, rather than political, barrier. And its route should take into account, consistent with security needs, its impact on Palestinians not engaged in terrorist activities ... It should be temporary rather than permanent, and, therefore, not prejudice any final status issues, including final borders. The Europeans, on the other hand, have been unanimous and firm in opposing the construction of the fence since its inception. On November 18, 2003, the European Council urged Israel "to stop and reverse the construction of the so-called security fence inside the occupied Palestinian territories, including in and around East Jerusalem, which is in departure of the armistice line of 1949," adding that the fence was not only unacceptable but also "in contradiction to the relevant provisions of international law." On July 20, 2004, all twenty-five members of the European Union voted for a resolution in the U.N. General Assembly, opposed by the United States, demanding the barrier's removal. The European Council reiterated in its "Conclusions" of December 8, 2009, that the "separation barrier where built on occupied land [is] illegal under international law." Europe affected U.S. policy on the fence by funding a sophisticated PLO diplomatic team, the elite Palestinian unit known as the Negotiation Support Unit of the PLO (NSU), headed by Palestinian chief peace negotiator Saeb Erekat. The NSU is funded by Britain's Department for International Development and has also received financial support from the governments of Denmark, the Netherlands, Norway, and Sweden. It consists of more than twenty professionals who periodically lobby Washington policymakers on behalf of the PLO with the participation of Palestinian advisers including Diana Buttu (Canadian-Palestinian), Michael Tarazi (American-Palestinian), Omar Dajani, and Amjad Atallah. A high point in the work of the NSU was a dramatic PowerPoint presentation on Israel's security fence given to National Security Adviser Condoleezza Rice by the NSU's Stephanie Koury (a Lebanese American from Texas) during a visit to the West Bank on June 28, 2003. Hours later, Rice shocked and angered members of the Israeli cabinet when she asked them to "reconsider" the fence. Koury's presentation caused the Bush administration to become much more critical of the security fence. A few days after the Koury briefing, an AIPAC colleague and I met with Rice privately and heard an unfiltered expression of her reaction to Koury. Three weeks later, the NSU team flew to Washington to make the presentation to other U.S. officials and members of Congress. Rice's anger over the fence was the low point of relations between Washington and Jerusalem during the George W. Bush years, and Palestinian lobbying funded by the Europeans achieved it. Israel's Targeted Killing of Terrorists Is "Illegal"
Israel follows a policy of targeted killings of terrorists who are preparing specific acts of violence or operationally engaged in organizing, planning, financing, and arming such operations. The purpose is to prevent imminent attacks when Israel does not have the means to make an arrest or foil the attacks by other methods. Israeli security officials believe that this policy keeps potential bomb makers on the run and serves as a deterrent to militant terrorist operations. Israelis also believe that targeted killings have less impact on Palestinian non-combatants than would a military incursion into a Palestinian population center aimed at their capture. On December 13, 2006, the Supreme Court of Israel ruled that targeted killing was a legitimate form of self-defense against terrorists within specified rules of conduct. The Israeli public strongly supports the policy of targeted killing: 90 percent in one poll, 75 percent in another. U.S. State Department spokespersons have at times expressed disagreement with the Israeli policy of targeted killings, for example, on August 8, 2001, November 5, 2002, and April 17, 2004. In reality, Washington accepts the Israeli policy as long as it seeks to neutralize imminent threats. The United States itself has become the world's leading practitioner of targeted killings according to a recent report by the U.N.'s special rapporteur on extrajudicial executions. The George W. Bush administration used drones to attack militant targets forty-five times. The Obama administration has increased the attacks to fifty-three in 2009 and to thirty-nine in the first half of 2010 in Pakistan alone, according to the New America Foundation, which also found that drone strikes since Obama took office had accounted for approximately 450 deaths, about one-quarter of them civilians. Michael E. Leiter, head of Obama's National Counterterrorism Center, defended the policy on July 1, 2010, saying that it would be "wholly irresponsible" not to stop those plotting to harm Americans. Like the Israeli public, majorities of Americans support targeted killings of terrorists. But the Europeans have shown less tolerance than do Americans for the Israeli policy. On December 13, 2002, the European Council called upon Israel "to stop excessive use of force and extrajudicial killings, which do not bring security to the Israeli population." On November 18, 2003, the council said targeted killings were unlawful and urged Israel "to abstain from any punitive measures which are not in accordance with international law, including extrajudicial killings and destruction of houses." On January 17, 2004, EU spokesman Diego Ojeda said that the "European Union has spoken on several occasions against [Israel's] so-called extrajudicial killings of suspected terrorists." In February 2010, President Nicolas Sarkozy declared France's "irrevocable condemnation of what is nothing less than an assassination" by Israeli agents of a Hamas commander in Dubai. In December 2007, the Palestinian Centre for Human Rights produced a harshly critical paper on the illegality of "extrajudicial execution" by Israel, a publication "produced with the assistance of the European Union." There is an element of hypocrisy in the European claim that Israel's use of targeted killings is unlawful because some of the European governments that approve these statements engage in the practice themselves. In July 2010, a British official revealed that a U.K. spy agency pinpoints the hiding places of al-Qaeda and Taliban chiefs in Afghanistan and Pakistan for targeted killings by U.S. drones. British agents attempted to kill German field marshal Irwin Rommel during the North African campaignand did kill SS Obergurppenführer Reinhard Heydrich in 1942. In May 1987, in Loughgall, Northern Ireland, a British special operations unit killed eight Irish Republican Army (IRA) militants who were preparing to attack a police station. A year later, on March 7, 1988, British security forces killed three IRA militants in Gibraltar as they walked toward the border with Spain. In July 2010, the French government acknowledged that its security forces assisted in killing six terrorists in Mali linked to al-Qaeda to prevent a terrorist attack in Mauritania. Israel's Blockade of Gaza Is "Illegal"
On May 31, 2010, French ambassador Gérard Araud told the U.N. Security Council that Israel's blockade of Gaza is illegal and unsustainable and should be lifted. Araud added that Israel's use of force against the Turkish flotilla was unjustifiable and disproportionate. British prime minister David Cameron agreed: "The Israeli attack on the Gaza flotilla was completely unacceptable ... Gaza must not be allowed to remain a prison camp." Meanwhile Foreign Secretary William Hague told the House of Commons that the blockade of Gaza was "unacceptable and unsustainable." The British ambassador to the U.N. demanded that Israeli restrictions on access to Gaza be lifted to allow unfettered access and the unimpeded flow of humanitarian aid, commercial goods, and persons to and from the enclave, which, he said, was among the highest international priorities of the new British government. Former EU commissioner Patten argued that the Israeli blockade was "immoral, illegal, and ineffective." Here again the European position is hypocritical. From 1993 to 1996, twelve European navies participated in a NATO-Western European Union blockade known as "Sharp Guard," enforcing both an arms embargo and economic sanctions on the former Yugoslavia. This involved the navies of Belgium, Denmark, France, Germany, Greece, Italy, the Netherlands, Norway, Portugal, Spain, Turkey, and the U.K. Some 74,000 ships were challenged; almost 6,000 were inspected at sea, and more than 1,400 were diverted and inspected in port. Had there been violent resistance to this blockade, all the parties enforcing it were committed to the use of force. The fact that no one dared to challenge this powerful blockade prevented violence from occurring, not any principled objection to the use of force. Nonetheless, the Europeans at the U.N. Security Council continue to put Israel on the defensive about its Gaza blockade, making it more difficult for Washington to support Israel's right to self-defense under article 51 of the United Nations charter. The Europeans evidenced a similar attitude in July 2006 when Israel went into Lebanon in response to Hezbollah attacks. An agreed statement by the EU presidency stated, "The European Union is greatly concerned about the disproportionate use of force by Israel in Lebanon in response to attacks by Hezbollah on Israel." French foreign minister Philippe Douste-Blazy agreed that Israel's strikes were "a disproportionate act of war" and said that the French government supported "Lebanon's demand for a referral to the United Nations Security Council as soon as possible." President Ronald Reagan said in 1981 that Israel's settlements were "ill-advised," "unnecessarily provocative," and "an obstacle to peace," but he also said that they were "not illegal." This distinction has been the implicit policy of all successive U.S. administrations since Reagan. The George W. Bush administration added a further distinction between settlement blocs on territory that the Palestinians are expected to cede to Israel in a land swap in future negotiations (as Arafat agreed as part of the Clinton parameters negotiated at Camp David in 2000), versus isolated settlements deeper in the West Bank interior on land expected to fall under eventual Palestinian sovereignty. President Bush considered that the settlements in the West Bank interior were more problematic while the blocs on land to be swapped could be accommodated. Barack Obama apparently has rejected these Bush refinements, and his administration seems to consider all Israeli settlements equally problematic. But even Obama has not returned to the pre-Reagan assertion that the Israeli settlements are illegal. However, on this issue, again Europe is closer to the Arab side and is more critical of Israel than the United States is. On June 13, 1980, the European Economic Community, the precursor to the EU, affirmed in its Venice declaration that "these settlements, as well as modifications in population and property in the occupied Arab territories, are illegal under international law." On December 8, 2009, the EU Council reiterated this belief: "Settlements ... demolition of homes and evictions are illegal under international law." The juridical premise on which the European policy is based is that Israel is occupying land taken from another sovereign power. But the pre-1967 boundary was nothing more than a demarcation of the positions held by opposing armies when the fighting stopped in 1949, never recognized by either side as a permanent political border. Nor has the Jordanian occupation of the West Bank prior to 1967 been recognized by any country apart from Britain and Pakistan. The West Bank is disputed rather than occupied territory, so the Geneva Convention cannot be applied as the Europeans seek to do. The Europeans are reifying a temporary holding line that existed for less than eighteen years (1949-67) while ignoring realities that have lasted for twice as long (1967-2010). For Israelis, more important than an arcane legal dispute is the practical impact of declaring all Jewish communities across the pre-1967 line to be equally illegal. That statement, if true, would mean that more than half the Jews in Jerusalem, the nation's capital, are living unlawfully on somebody else's land in homes the Israelis built and paid for in completely Jewish, established communities including Gilo, French Hill, and Pisgat Ze'ev, which are across the previous armistice line. Israelis do not consider these to be settlements at all. It would mean that Maale Adumim, a sprawling metropolis of 36,500 people, is lumped together with nearly unpopulated dots on the map. It would also mean that the militarily indefensible pre-1967 line is recognized under international law as permanent, in contravention of a fact that was implicitly acknowledged by Security Council Resolution 242, which envisaged Israel's retention of some territories captured in the 1967 war. European intervention often inflames controversies over settlements between Washington and Jerusalem, frictions that have had a particularly destructive effect in the case of the Obama administration. Martin Indyk, an adviser to Obama's secretary of state Hillary Clinton and Middle East envoy George Mitchell, said recently: "I don't think that ... Barak Obama, Hillary Clinton or George Mitchell—want to get waylaid again by an argument about settlements [instead of] the main challenge which is to reach an agreement on what the borders of the Palestinian state will be ... The settlement issue will be resolved as a result of that." European pressure has pushed the Obama administration to emphasize the thorniest part of the settlement issue, Jewish housing in Jerusalem. Bill Clinton wisely avoided this minefield even when, in 1995, the Yitzhak Rabin government gave approval for 5,000 new housing units to go up in East Jerusalem because, as an adviser said, "To take action now ... would be very explosive in the negotiations, and frankly, would put us out of business as a facilitator of those negotiations." European leaders are the most effective external force urging the U.S. government to move away from Israel and closer to the Arabs. Europe is not hostile to Israel on every issue, and not every European intervention with U.S. officials is meant to move U.S. policy in the Arab direction. But, on the whole, the Arab road to Washington runs through Paris, London, and Berlin. Steven J. Rosen served for twenty-three years as a senior official of the American Israel Public Affairs Committee. He is now director of the Washington Project of the Middle East Forum. "Arab Americans," US4Arabs.com, accessed Aug. 16, 2010; "Arab Americans," Arab American Institute, accessed Aug. 16, 2010. "Press Statement on ADC NAAA Merger," Arab-American Anti-Discrimination Committee, Dec. 29, 1999. Isaiah Kenen, The Jewish Digest, Dec. 1975. Steven Emerson, The American House of Saud (New York: Franklin Watts, 1985). Ha'aretz (Tel Aviv), Jan. 9, 2004; Reuters, Jan. 9, 2004. The Guardian (London), July 18, 2010. "Military Defense Spending and Budgets by Country," GlobalFirepower.com, accessed Aug. 16, 2010. Donald Neff, "Israel Requests $10 Billion in U.S. Loan Guarantees for Soviet Immigrants," Washington Report on Middle East Affairs, Apr./May 1995, pp. 79-80. George H.W. Bush, address before joint session of Congress, Mar. 6, 1991. Neff, "Israel Requests $10 Billion." The New York Times, Jan. 31, 1990. Neff, "Israel Requests $10 Billion"; The Christian Science Monitor, Jan. 11, 2010. Leon T. Hadar, "Showdown at the Settlements Corral: Can Obama Remake the Bush-Baker Classic?" Foreign Policy, Mar. 25, 2010. "The Arab-Israeli Peace Process Progress Report - 8 Apr. 1992," Israel Ministry of Foreign Affairs, Jerusalem, Apr. 8, 1992. "Al-Aqsa Intifada," The Jerusalem Forum, Amman, accessed Aug. 16, 2010. Los Angeles Times, Sept. 7, 1991. Foreign Policy, Mar. 25, 2010. "GCC: Trade in Goods," Europa, European Union, Brussels, accessed Aug. 19, 2010. "Middle East: Israel, Economy," 2010 World Fact Book, U.S. Central Intelligence Agency, McLean, Va., Aug. 3, 2010. "Quartet Roadmap to Israeli-Palestinian Peace," MidEast Web, Rehovot, Sept. 17, 2003. Agence France-Presse, Sept. 18, 2002. "Chronological Review of Events Relating to the Question of Palestine, November 2002," United Nations Information System on the Question of Palestine (UNISPAL), New York, accessed Aug. 16, 2010. "Quartet Roadmap to Israeli-Palestinian Peace," MidEast Web, Rehovot, Apr. 30, 2003. "Quartet Statement on the Middle East," European Union @ United Nations, European Commission, Sept. 17, 2002. Bernard Kouchner and Miguel Angel Moratinos, "A Palestinian State: When?" Le Monde (Paris), Feb. 23, 2010. The Guardian, Nov. 16, 2009. Voice of America, Nov. 17, 2009. "Statement by Middle East Quartet," U.N. Secretary-General, New York, Mar. 19, 2010. Palestine Note (Washington, D.C.), July 27, 2010. Israel-United States Memorandum of Understanding, Congressional Record, Washington, D.C., Sept. 1, 1975. The International Security and Development Cooperation Act of 1985, 22 U.S.C. 2151 note, Public Law 99-83, sect. 1302, Oct. 1, 1985. "U.S. opens dialogue with PLO - Ronald Reagan, George Shultz statements," U.S. Government Printing Office, Washington, D.C., Dec. 14, 1988. "Venice Declaration," archives, The State of Israel, Jerusalem, June 13, 1980. Rory Miller, "The PLO factor in Euro-Israeli relations, 1964-1992," Israel Affairs, Oct.-Dec. 2004 , pp. 123-55, ftnt. 33. "Hezbollah," International Terrorist Symbols Database, accessed Aug. 17, 2010. "Adding Hezbollah to the EU Terrorist List," hearing before the Subcommittee on Europe, Committee on Foreign Relations, U.S. House of Representatives, Washington, D.C., June 20, 2007. Muriel Asseraf, "Prospects for Adding Hezbollah to the EU Terrorist List," American Jewish Committee, New York and Washington, D.C., Oct. 1, 2007. Softpedia, Aug. 2, 2006; European Jewish Press (Brussels), Aug. 1, 2006. France 24 TV news, June 14, 2006. Egypt.com News (Cairo), Apr. 15, 2009. Briefing, French Ministry of Foreign Affairs, Paris, July 10, 2007. Pierre Tristam, "The 1983 Attack on U.S. Marines in Lebanon," About.com, accessed Aug. 17, 2010; "23 October 1983: A Blast that Still Echoes," U.S. Naval Institute, Annapolis, no. 22, Oct. 2009. Muhammad Sahimi, "The Fog over the 1983 Beirut Attack," Frontline, Public Broadcasting Service, Oct. 24, 2009. USA Today, May 30, 2003. "Freezing Funds: List of Terrorists and Terrorist Groups," Europa, European Union, Brussels, Dec. 27, 2001. Journal of the European Union, C70E/140, Mar. 20, 2004. "The Hamas Terror War against Israel," Israel Ministry of Foreign Affairs, accessed Aug. 17, 2010. European Jewish Press, Aug. 13, 2007. "EU's Solana: 'Hamas Doesn't Want to Destroy Israel,'" Jihad Watch, Oct. 30, 2006; Israel News Agency (Jerusalem), Jan. 15, 2009. France 24 TV news, Jan. 21, 2009. The Guardian, July 18, 2010. YNet (Tel Aviv), Aug. 29, 2006; The Irish Times (Dublin), Jan. 28, 2009. Rory Miller, "Why the European Union Finally Sidelined Hamas," inFocus Quarterly, Fall 2007. EUobserver (Brussels), Sept. 1, 2007. European Jewish Press, May 14, 2007. Miller, "Why the European Union Finally Sidelined Hamas." "Suicide and Other Bombing Attacks in Israel Since the Declaration of Principles (Sept 1993)," Israel Ministry of Foreign Affairs, Jerusalem, accessed Aug. 17, 2010. "U.S. Policy on the Separation Barrier and Statements from Church Leaders," Churches for Middle East Peace, Washington, D.C., accessed Aug. 17, 2010. George W. Bush to Ariel Sharon, Ariel Sharon to George W. Bush, in Ha'aretz, June 6, 2009. "Declaration of the European Union," Fourth Meeting of the Association Council EU-Israel, Brussels, Nov. 17-18, 2003, p. 5. Res. ES-10/15, U.N. General Assembly, New York, July 20, 2004. "Council Conclusions on the Middle East Peace Process," European Union, Brussels, Dec. 8, 2009. "Development Assistance and the Occupied Palestinian Territories," Second Report of Session 2003–04, International Development Committee, House of Commons, London, p. 21; "About Us," PLO Negotiations Affairs Department, accessed Aug. 18, 2010. The Forward (New York), July 18, 2003. Gal Luft, "The Logic of Israel's Targeted Killing," Middle East Quarterly, Winter 2003, pp. 3-13. "HCJ 769/02 Summary Judgement," The Public Committee against Torture in Israel v. The Government of Israel, Israeli Supreme Court, Jerusalem, Dec. 13, 2006. Steven R. David, "Fatal Choices: Israel's Policy of Targeted Killing," Begin-Sadat Center for Strategic Studies, Bar-Ilan University, Ramat Gan, Sept. 2002, p. 7. News briefing, U.S. Department of State, Washington, D.C, Aug. 8, 2001. BBC News, Nov. 6, 2002. Chris Toensing and Ian Urbina, "Israel, the US and 'Targeted Killings,'" Middle East Report, Feb. 17, 2003. Philip Alston, "Report by the Special Rapporteur on Extrajudicial, Summary or Arbitrary Executions," United Nations, New York, May 28, 2010. National Public Radio, Mar. 25, 2010. "The Year of the Drone," New America Foundation, Washington, D.C., and Sacramento, Calif., accessed Aug. 18, 2010. Los Angeles Times, July 1, 2010. David, "Fatal Choices: Israel's Policy of Targeted Killing," p. 18. "Conclusions of the Copenhagen European Council," Brussels, Dec. 13, 2003. "Declaration of the European Union," Nov. 17-18, 2003, p. 4.
 International Middle East Media Center (West Bank), Jan. 17, 2004. The Tehran Times, Feb. 23, 2010. "Position Paper: Extra-Judicial Execution," Palestinian Centre for Human Rights, West Bank, Dec. 2007. Fox News, July 25, 2010. "The Assassination of Reinhard Heydrich," Central Intelligence Agency, McLean, Va., Sept. 22, 1993. "Special Air Service (SAS) - Loughgall, Northern Ireland," British Special Forces and Elite Units, Kent, U.K., accessed Aug. 18, 2010. "1988: IRA Gang Shot Dead in Gibraltar," BBC, accessed Aug. 18, 2010. "Security Council Condemns Acts Resulting in Civilian Deaths during Israeli Operation against Gaza-bound Aid Convoy," U.N. news office, New York, May 31, 2010. The Guardian, July 27, 2010. "Security Council Condemns Acts Resulting in Civilian Deaths," May 31, 2010. The Jewish Chronicle (London), July 19, 2010. "NATO/WEU, Operation Sharp Guard," North Atlantic Treaty Organization, Brussels, Oct. 2, 1996. Charter of the United Nations, San Francisco, June 26, 1945, art. 51. Deutsche Welle (Bonn), July 14, 2006. Gerald M. Steinberg, "Europe's Disproportionate Criticism," The Wall Street Journal, July 17, 2006. "Quotes from U.S. Government Officials on Israeli Settlements," Churches for Middle East Peace, Washington, D.C., accessed Aug. 18, 2010. The Washington Post, June 17, 2009. Steven J. Rosen, "Tough Love Is No Love at All," ForeignPolicy.com, July 21, 2009. "Venice Declaration," June 13, 1980. "Council Conclusions on the Middle East Peace Process," Dec. 8, 2009. Jeffrey Helmreich, "Diplomatic and Legal Aspects of the Settlement Issue," Jerusalem Issue Brief, Jan. 19, 2003. The Yale Globalist (New Haven), July 4, 2010. "The Situation in the Middle East," U.N. Security Council Res. 242, Nov. 22, 1967. Natasha Mozgovaya, "Martin Indyk: I Think the Settlement Issue Will Be Resolved," Ha'aretz, July 28, 2010. Steven J. Rosen, "Obama's Foolish Settlements Ultimatum," Foreign Policy, Apr. 1, 2010. Related Topics: Muslims in Europe | Steven J. Rosen | Fall 2010 MEQ receive the latest by email: subscribe to the free mef mailing list This text may be reposted or forwarded so long as it is presented as an integral whole with complete and accurate information provided about its author, date, place of publication, and original URL.